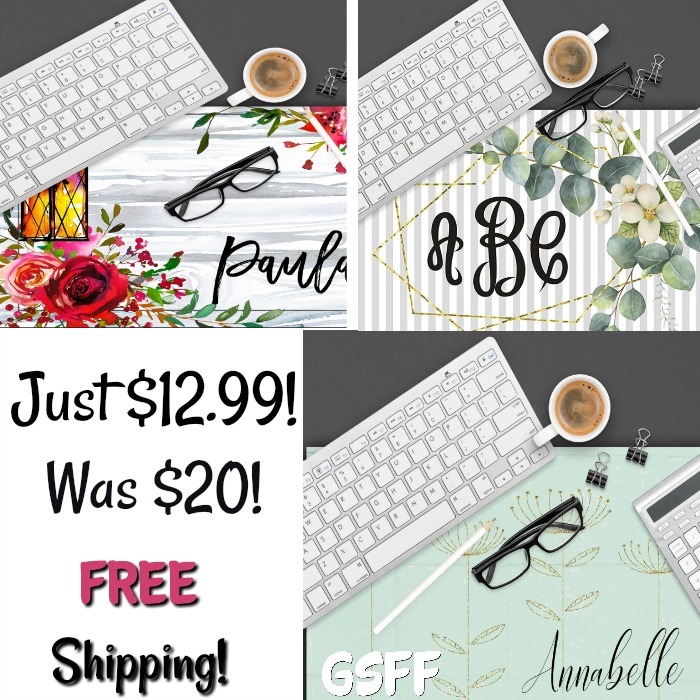 Personalized Desk Mats Just $12.99! Down From $19.99! PLUS FREE Shipping! You are here: Home / Great Deals / Personalized Desk Mats Just $12.99! Down From $19.99! PLUS FREE Shipping! Right now you can get these beautiful personalized desk mats for just $12.99 down from $19.99! PLUS FREE shipping! I LOVE a desk amt! My son always gets me a desk calendar every year and then proceeds to fuss all year that I never rip off the months as they go by. I really like it just for the “mat” part, not for the calendar part. Add style to your desk with these X-Large top of the desk mat. Choose from 20 custom designs. add your personalization. Your name will be printed exactly as you enter it in the personalization box with the font you see on the pictured desk mat.